One step forward, two steps back…you may feel you’re doing a dance just to stay on track, and may not make much progress toward your goals. Consider re-evaluating, especially if there are new developments with a partner. Emotional turmoil can deplete your physical vitality. Physical ailments can brew to a crisis point by July 28, and you’ll be better prepared to deal with them if you’re clear about your emotional needs. Tension in relationships at home mounts, and the rifts between family can involve deceptive undermining unless you can bring issues into the open and deal with them honestly. Denial or escape only make things worse, but strengthening your inner awareness during the Moon on July 12 can be stabilizing. The lunar eclipse on July 28 centers your attention on partners and needs of others, and if someone is standing in your way, you may determine that it’s time to reach closure and move on with your life. Before you set those lofty plans in motion you need to regroup. Mercury’s retrograde from July 12 to August 5 can be clarifying, but you are vulnerable to deception, especially if you’re blinded by ambition. 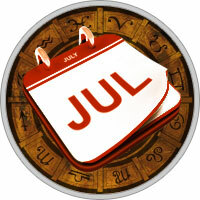 Financial risks will only get you into trouble, although your judgment is relatively clear from July 1 to 11. Look over your opportunities carefully. This is the time to clear the way for change, finishing up old business, researching, organizing and regrouping. Clarify your motivations during the Moon’s eclipse on July 28.